It is a common misperception that the most glorious displays of autumn foliage are seen in the Eastern United States and that our California climate lacks dramatic indications of seasonal change. Perhaps it is my East coast roots that compel me to fill my garden with specimens that shine in the fall; I think it is rather that I prefer the fiery hues of fall to the deep pinks and blues of summer and the pastels of spring. I also find the light in autumn softer and more pleasing than the harsh summer sun. Following is a collection of photos from my garden taken in November of last year. Most of these plants are delightful garden specimens in other months; the Berberis ‘Red Jewel’, for example, is evergreen (or ever-red!) and simply deepens its color in autumn and winter. 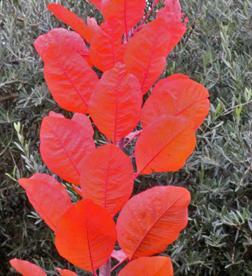 The Cotinus has lovely maroon foliage all spring and summer, with smoky flowers for added appeal. The Acer shirasawanu, like most Japanese maples, has stunning spring foliage, decent summer display and then goes out in a blaze of orange and salmon. Most of us tend to get the ‘garden itch’ in spring when we’ve been housebound and are eager to get outdoors and play in the soil. 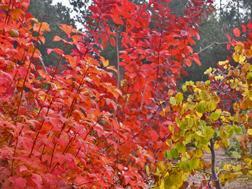 Try focusing on fall foliage for a change and doing some planting to increase your garden’s autumn punch. It may be too late to find many specimens in the nurseries, as they are starting to close or scale back for the winter. However, it is not too late to observe the plants that you do see in nurseries or public spaces and botanical gardens and make a list for next year. Quarryhill Botanical Gardens and Berkeley Botanical Gardens are excellent places to view fall foliage on display. Matanzas Creek Winery in Santa Rosa also has some nice color at this time of year. Viburnum opulus ‘Roseum’ and Cornus stolonifera ‘Silver and Gold’ provide a soft, glowing display that rivals any flowering plant. As it happens, both ARE flowering plants and look gorgeous in spring, as well. 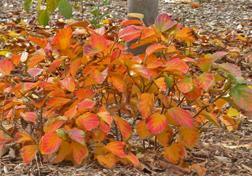 As an added bonus, the Cornus has dressy variegated leaves. 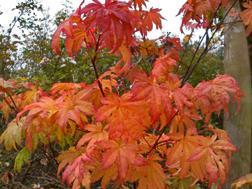 Acer shirasawanum ‘Autumn Moon’ is a lovely, small tree suitable for container planting on the patio. Its spring display is as remarkable as its autumn color. 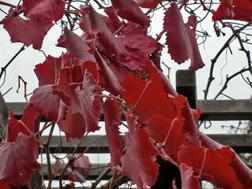 Vitis californica ‘Roger’s Red’ produces the boldest, reddest leaves I have ever seen on a plant. A superior variety of the native grape, this vine provides deep shade when grown on an arbor and when back-lit in autumn it is a show-stopper. Viburnum opulus ‘Roseum’ is commonly called snowball bush for the large round snowy white flowers that it produces in spring. If I had named it I would have called it ‘sunset bush’, as its fall color rivals even the most dramatic sunsets. Look how beautifully the glaucous foliage of the Echium works with the fiery Viburnum. While a more difficult plant to find in the trade, Fothergilla major ‘Mount Airy’ provides soft yellow flowers in spring, crisp green foliage throughout the summer and then a blaze of deep yellow in fall. 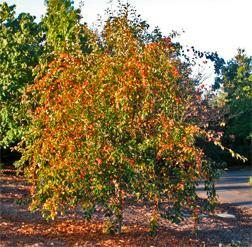 Malus 'Professor Sprenger', an orange crabapple, is loaded with pumpkin-colored fruit from September through December. When the leaves drop off in a few weeks the prolific berries really light up the landscape. Another example of how to use the blue-gray, or glaucous, foliage in combination with autumn hues is this Cotinus ‘Grace’ seen against a backdrop of a large, fruitless olive tree (Olea wilsonii). 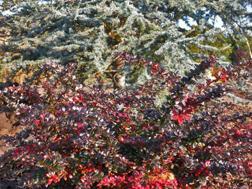 Another great red and gray combination is this Berberis x ‘Red Jewel’ next to a large Atlantic cedar (Cedrus atlantica ‘Cascade’). 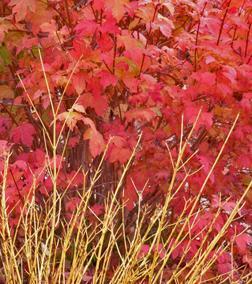 The contrast of both the colors and textures provide interest that lasts through autumn well into winter. 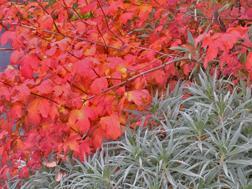 Not to be outdone by its cousin, Berberis ‘Rose Jewel’ also puts on an autumn show. 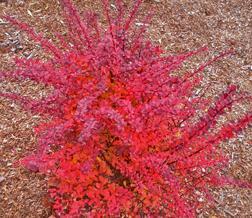 This deciduous Berberis has lovely, soft rosy foliage all spring and summer, and then really turns on the heat once the days shorten. 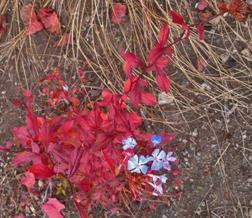 This Ceratostigma willmottianum demonstrates why, even as a young plant, it is a Sonoma County Superstar. Those blue flowers will cover it all spring and summer, when its green leaves are set off by warm brown stems. Now in autumn the leaves look as if they've been lacquered red. People grow it for the blossoms, but right now they're taking a back seat! A trifecta of Viburnum, Cotinus and Cercis c. ‘Traveler’ produces an incendiary display that almost has me running for the fire extinguisher. If you aren't a fan of the usual 'hot' autumn colors, you can have pastels in autumn, too. 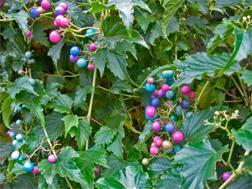 This Ampelopsis brevipedunculata, or porcelain berry, looks like it should be wearing its berries at Easter instead of Halloween, which is when they are actually at their peak color.